Water from underground mines could be used to provide cheaper heat for almost 1,000 homes in Bridgend county. 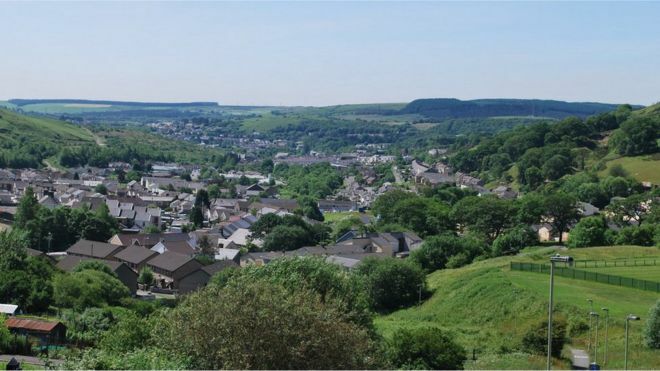 Bridgend council is investigating whether disused mines in Caerau, Llynfi Valley, could offer a geothermal source of energy. The plans, which are in the early stages, would see water pumped through a network of pipes to heat homes. Councillor Ceri Reeves said the potential benefit of the project "was huge". The county council is conducting a feasibility study into the scheme which, it said, could be rolled out further afield if it gets the go-ahead. Under the plans, water filling the mines, with an average temperature of 10-14 degrees Centigrade, could be transported to properties through a pipe link, similar to that at the incinerator at Splott. 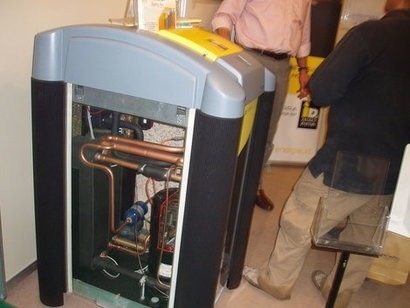 The heat would then be extracted and used in radiators. No mine water would enter residents' homes, under the council's plans. A second study is looking at using steam from the proposed Llynfi Valley Biomass Power Station to create a "heat network" to to replace gas boilers in up to 10,000 homes. The studies come after a £67,000 grant from the UK government's Department of Energy and Climate Change. Ms Reeves said: "The council has commissioned a detailed ground condition survey to ascertain whether the water held in the mine workings under Caerau provides a natural heat source which could provide safe, continuous, and cost effective heat for a large number of local homes." The City of Stockholm is positioning itself as a global hub for sustainable data centres by recovering the excess heat to warm homes, reports Fast Company. As part of longer-term strategy to meet energy and climate goals, Stockholm is looking to supply 10 percent of the city’s residential heating demand through excess heat recovered from data centres. According to Stockholm Data Parks, the initiative launched last month in partnership with infrastructure firms Stokab, Fortum Värme and Ellevio, one ten-megawatt data centre can provide enough heat for 20,000 apartments – saving almost 8,000 tonnes of CO2. The city is attracting companies to run their data centres from Stockholm by offering the opportunity to get paid for the waste heat from servers or receive free cooling from utility companies in exchange for excess heat. Businesses that have already signed up include Interxion, IBM, Ericsson and Bahnhof. District heating operator Fortum Värme will provide the heat pumps that concentrate the thermal energy – usually the most expensive component of a waste heat recapture system. The partnership model helps get around some of the barriers to re-using waste heat, including the need to raise significant upfront investment for such technologies. The scheme will be expanded to another three locations – Brista, Skarpnäck and Väsby – over the next three years. The Stockholm Data Park website has a nicely presented overview on how the ‘internet to heating homes’ idea works, which can be viewed here. The Pan-European Thermal Atlas (Peta4), launched in Brussels, is an interactive online map of the heating and cooling demand, efficiency and supply in Europe. Created by the Heat Roadmap Europe (HRE) project, it provides visual and technical data for heating and cooling projects, giving users an appropriate analysis tool and easier access to relevant data. “For years, power plants, industry, and waste incinerators all across Europe have been throwing away enormous quantities of heat and for the most part, this has gone unnoticed” said David Connolly, HRE project coordinator. “Peta4 enables policymakers, planners, suppliers and researchers to identify hotspots so they can replace the energy created by fossil fuel boilers with this excess heat instead. It’s amazing how much heat is being wasted in cities that currently spend millions on natural gas to heat their buildings. This tool will help save money, carbon emissions, and energy consumption. Cities can meet their EU energy targets while also cutting costs for consumers”. Peta4 covers the 14 EU member states that are part of the Heat Roadmap Europe project. Developed by project partners at Halmstad University, European University Flensburg and Aalborg University, it creates maps with specific and realistic data on the location and scale of heat demand and excess heat, which will facilitate the development of energy system solutions across Europe. A new drying technique developed in Finland is likely to benefit combined heat and power and heat network technologies. An artificial dryer deployed at the Natural Resources Institute Finland is being used to dry wood chips in a way that makes them more effective for bioenergy use. The dryer, in the form of a shipping container, is developed by Finnish company SFTec and claims to have overcome some of the technical issues that have defied other dryers, when it comes to eliminating moisture in fuel chips, which affects heating value and the amount of energy obtained from the chips. Damp forest chips burn imperfectly, which also means that emissions increase. Bioenergy News reports that such chips are used in heating buildings, in small-scale district heating plants and in heating and power plants for towns and industry. They are collected from young forests, from logging residues in regeneration fellings and from stumps and rot damaged trunks. “The higher the moisture content of fuel chips, the less energy they provide,” said Juha Laitila, principal research scientist at Luke. “There are a wide range of artificial dryers on the market. The advantage of our dryer lies in that relative to its size the equipment is efficient, easily moveable and it is suitable for various materials, including wood chips,” said SFTec managing director Jani Isokääntä. ”Essentially, our investment in this new technology is about digitalising the district heating supply, and the acquisition of the remotely read meters is the natural next step for our district heating area”, says Lasse P.N. Olsen, Chairman of the Board at Aalborg Energy Group. ”Digitalisation is not a target that should stand on its own. We expect the investment to result in lower operating costs to a degree where the investment is actually still viable. That has been an equally important target for us. First of all, operation of the new wireless system will be cheaper, and secondly we expect to be able to provide faster customer service resulting in a more efficient distribution network. The new technology will also be an important element in the future energy transition of the district heating system, where there will be a need for more knowledge on the customers’ consumption on one side and our production on the other”, explains Jesper Høstgaard-Jensen, CEO at Aalborg District Heating. ”Besides better customer service due to remote reading, the precise and frequent data will give Aalborg District Heating the necessary transparency to optimise their distribution network. In addition, flexibility ensures that the solution is both financially attractive and future-proof in relation to energy efficiency and the transition to renewable energy,” says Jesper Kjelds, Senior Vice President at Kamstrup. Jesper Kjelds is also looking forward to develop the long-standing co-operation between the two companies. The collaboration with Aalborg District Heating underlines Kamstrup’s position as the market’s leading supplier of intelligent heat and cooling metering solutions. The company is experiencing rapid growth and delivers energy efficient solutions all over the world. District heating has gained an important position internationally, and there is a growing political focus on utilising energy resources more efficiently. High energy efficiency requires/necessitates transparency for utilities as well as for the consumers, and, as a result, digitalisation will play a crucial role in the future.